Next What’s Coming During Gen-Con 2018? Whether you are playing with another adult or are spending one-on-one time with your child, quick two player games are a must to have in your board game collection. While at Origins Game Fair, I had the opportunity to take a quick peek at Hanamikoji but did not get to play it. Thanks to Deep Water Games, we received this game to review prior to its re-release at Gen Con 2018. Deep Water Games has partnered with Emperor S4 to bring the reprint of Hanamikoji to the North American market. It is a quick two player card game that is easily played within 15 minutes. Hanamikoji is a street within Gion, the most famous geisha district in Kyoto, Japan. Geishas are highly trained professional entertainers and expert hostesses. In this game, you are trying to win the favor of the Geishas by offering their preferred performance items. It takes a bit of luck and strategy to win! This game is easy to teach and have you playing within minutes. To start, lay out all seven Geisha cards in a row between you and your opponent. Next, place a favor marker in the middle of each Geisha card and hand out the four action markers to each player. Shuffle the deck and randomly remove a card. Without looking at it, place it in the box. This card will be out of play during the game. The numbers on the Geisha cards indicate the number of each performance item found in the deck. Removing one can make deduction a little more tricky. 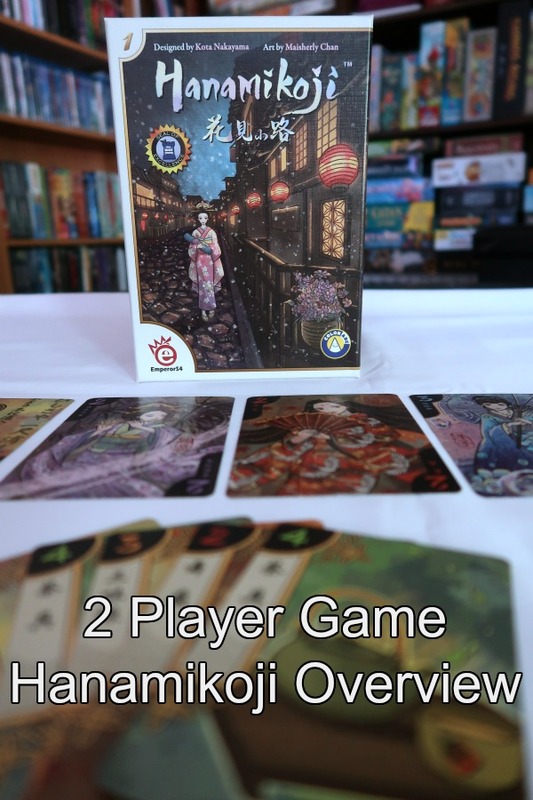 After removing a random card, deal six cards to both players and set the rest of the deck next to the line of Geisha cards. The action phase is where Hanamikoji gameplay takes place. Players will alternate taking turns four times. On each player's turn, they draw a card from the deck, then select one of four actions until all four have been completed. To keep track, flip your action marker over from the color side to the gray and white side. The first action is called Secret. You secretly place a card face down under the action marker. This card will be revealed and played during the scoring phase. The second action is called Discard. You choose two cards you want to remove from play and place them face down under the marker. The third action is called Gift. You choose three cards and place them face up on the table. Your opponent selects one card and plays it by the corresponding Geisha on their side. 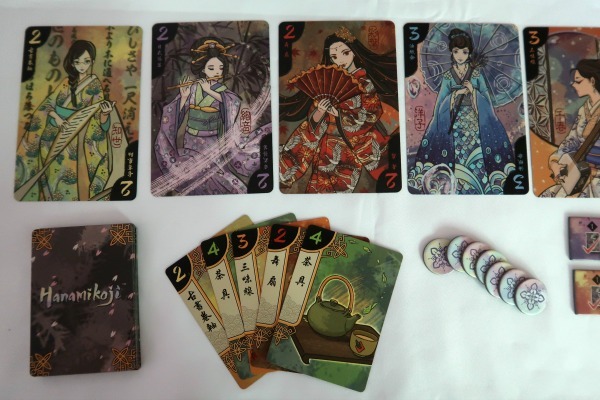 You then play the remaining two cards on your side of the corresponding Geishas. The fourth action is called Competition. You take four cards and put them into two sets of two face up on the table. Your opponent selects one set of cards and plays them. You play the remaining set of cards. After players alternate taking turns performing each one of the actions, no one should have any cards left and the deck should be gone. Now it's time to score. Both players reveal their secret cards and play them. Whoever has the most performance items wins that Geisha's favor. Slide the favor marker towards the player who won her favor. If there is a tie or no performance item cards played then the favor token stays in the middle. 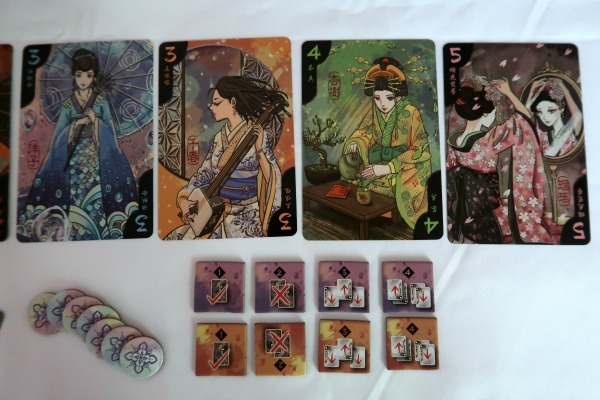 To win, a player must have the favor of four Geishas or 11 or more charm points (the number on each Geishas card). When a player wins, the game stops. If neither player won, it is time to move to phase four – Refresh. To refresh and play another round, collect all of the performance item cards (including the one discarded to the box) and shuffle them. Do not move the favor markers. After shuffling, remove a random card, deal six cards, and play again. If you were the start player during round one, then your opponent will be the start player for round two. When scoring round two, only move the favor markers if someone clearly won. For example, if you have the favor marker from round one and both of you played one performance item on that Geisha's card, it is a tie and you still have her favor. If neither player won round two, refresh and play a third round. At the end of the third round, the game is over. If neither player has the favor of four Geishas or has less than 11 charm points, the player with the most charm points wins. If both players are tied with the same number of charm points, then the player who has the Geisha with the highest point value is declared the winner. Upon opening the box, the first thing I did was admire the beautiful artwork on the Hanamikoji cards. I appreciate pretty artwork, but I also want to enjoy playing a game. When a table top game combines gorgeous artwork with game play I want to try again and again… well, that's a winner. Alright, so let's talk about my impressions of Hanamikoji. It is a two player card game that takes less than 15 minutes to play, making it a great filler game. It is also super easy to teach, especially through demonstration. I feel like it's faster to show someone how to play this game than it is to read through the rules. Of course, it's important to be familiar with the instructions before attempting to teach others to play. I love that it's light, enjoyable game that uses a mix of luck and strategy. We are still learning how to strategically play our cards and having plenty of fun doing it. Even if I lose, it's such a fast game that I can immediately challenge Brian to another game. While there is plenty of player interaction, it does not require reading. It doesn't even require you to speak which makes it great to play quietly if you have little ones napping or just don't feel like talking a lot. It also means it's not language dependent. The size of it also makes it perfect to take along on trips. I can see us taking it along to play silently in a hotel room after the kids go to sleep. It'd also work well in a noisy environment where it would normally be hard to hear other players. If you are seeking a quick two player game to add to your family game nights or a fun filler game you can take while traveling, I suggest picking up Hanamikoji. It's gorgeous artwork alone makes it a wonderful addition to your board game collection! Hi, do you have a list that shows more Quick Two Player Games? No, not yet, but it is on our list of posts to make. I’ll see about working on that one asap. We also love to play 2-player games. Thanks for the comment!